Can this ingenious hang-on-the-wall speaker compete? This is an exceptionally clever 'stealth' speaker, which takes unintrusiveness towards invisibility. The restrained sound shows mild bass thickening, but has a beautifully even, delicate and smooth midband, and impressive stereo imaging. The typical comment made by industry insiders was "they can't possibly work!" when they saw these hang-on-the-wall PMC speakers. They were wrong: the Wafer 2 most certainly is a real hi-fi speaker, even though it looks unlike the stereotypes. Conceived primarily as partners for flat video displays, there's no obvious reason why they shouldn't be used for stereo music - especially this larger (33.5x57.5x10cm) Wafer 2, which uses a similar 170mm bass/mid driver to PMC's more conventional FB1 floorstander and TB2 standmount, both Best Buys in our reviews. Despite the enclosure being a totally different shape, it still uses PMC's trademark transmission-line bass loading, featuring an H-pattern twin-line arrangement. It also incorporates several radical and interesting innovations. Two tweeters are fitted, and you can switch between either, or use both at once. Using just one tweeter enables the speakers to be mounted vertically or horizontally. Using both together 'steers' the treble upwards or downwards, so the speaker can be positioned well below or above ear level (for off-axis centre channel duties). 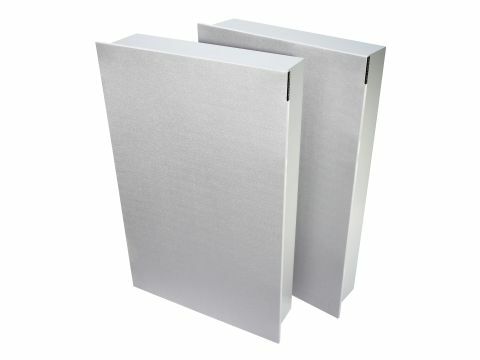 A special absorbent 'stealth baffle' front reduces secondary radiation from the surface next to the drivers. Finished in silky white, grey or black, both Wafer models come in two styles. One is intended to be flush mounted by being recessed into a stud-type wall; the other - reviewed here - fixes onto a solid wall, so that it stands proud by a modest 11cm. Installation is straightforward: a couple of cleverly tapered wall brackets lock the speaker firmly onto the wall. An oversize grille helps to disguise the box behind, and connection is made via a single terminal pair. Although most hi-fi speakers are intended for free-space siting, close-to-wall is by no means unknown, especially in recording studios where flush 'soffit' mounting is widespread. Both are trade-offs, and while true flush-mounting is preferable, knowing the exact position of a rearward wall means you can take its acoustic influence into account. The Wafer 2 delivers a far-field in-room averaged balance that holds within a very acceptable /-4dB, from 50Hz up to 1.3kHz. It's not particularly smooth through the bass register, and emphasises the 100-120Hz zone. The balance is much smoother above 400Hz, though the broad presence, 1.2kHz-4kHz, looks too restrained. While the bass rolls off (gently) below 50Hz, the measurements also confirm this is an easy to drive speaker, thanks to the generous 90dB sensitivity and eight-ohm load. Sound quality was an immediate and very pleasant surprise, confounding preconceptions predicting wall-reflected midband colorations. It isn't entirely neutral and free from coloration, but the midband is very smooth and even. Criticisms are minor. There's some mid-bass thickening, which can make bass lines sound strong and add chestiness to male voices. And the presence band can sound restrained, requiring some volume to improve diction.